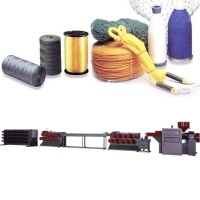 The machine is for the purpose to draw out plastic string for making mosquito net, screen, sofa, covers, women's wings, fishing net, ropes, nets and plastic rattan mat. 1. The automatic temperature control system employs a high precision micro-adjusting deviation indication gauge, with makes the temperature control more easily and precisely. 2. Adopts a frequency converting motor, with digitally displayed rotation speed, accurate frequency converting and power saving. 3. The front saeled board of the take-off machine is made of stainless steel and will not rust. 4. Our extrusion machines, take-off machines, screw rods and gears are all specially treated, ensuring durability. 5. Equipment with specially designed large and small lifting cooling tanks, preventing yarn from breaking. 6. The automatic water lever balancing device in the hot water chamber of the stretching machine ensures permanent balance. 7. The rotation distance of the yarn winding machine can be micro-adjusted steplessly. 8 Hydraulic sensing type yarn guiding system performs stably the speed and yarn with can be micro-adjusted. 9. Take-off machine can be equipped with line speed display(m/min).